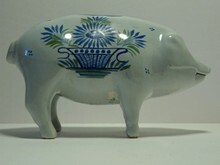 Recently I bought a genuine Quimper piggy bank from the USA. It was made by Henriot Quimper and it differs from the usual piggy banks made by Henriot (mould 393). Questioning the Musée de la Faïence the expert told me that it was specially made for the US market after 1968. In the slipstream of studying this particular bank I came across some lacks in my website presented information. I corrected that and added pictures of the different hallmarks of each Breton (Quimper/ Normandy) piggy bank.